In this episode of Chetco Activity Center, Senior Stories, Scott Clapson talks with 90-year-old Gerry Good about her key to living a full and happy life. They talk about beautiful Brookings, Oregon, her love of the ocean, and the Chetco Activity Center. She gives the scoop on the food, the most shocking thing about the Chetco Activity Center, and the secret of House Rock. Gerry moved to Brookings from California and has contributed over 15 years of volunteer service at The Chetco Activity Center. She discusses the many changes she has seen over the years at the non-profit center that plays such an important role in our community. You can find out more about the Chetco Activity Center at http://www.chetcoac.org or by calling 541-469-6822. Music is Moving Forward by Scott Holmes, from Free Music Archive, Creative Commons Attribution-NonCommercial 4.0 International license. In this episode of Chetco Activity Center – Your Gathering Place, host Scott Clapson sits down with LaVonne Engstrom the director of the Time Out for Me program at the Chetco Activity Center. LaVonne shares with Scott about this Adult Day Care Respite Program that is funded by a grant from the Older Americans Act. LaVonne operates the program with the help of volunteers who have experience in family caregiving. A typical day with Time Out for Me includes music, singing, games, crafts, and other activities to help give a day off for the family caregiver. If you know someone who is interested in enrolling their family member or someone they know in the Time Out for Me program, you can call LaVonne at 541-373-9001 or call the Chetco Activity Center at 541-469-6822. In this episode of Chetco Activity Center – Your Gathering Place, host Scott Clapson sits down with Marihelen Pitts-Campbell, the facilitator of the Family Caregiver Support Group. Many folks find themselves suddenly thrust into caring for a friend or family member. Being a caregiver is challenging, both emotionally and physically. Family Caregivers need support, and the Family Caregiver Support Group is there to help. You are not alone. Family Caregiver Support Group meets on the 2nd Monday of the month in the Chetco Activity Center dining room. Meetings alternate between a support group meeting and an education meeting with a guest speaker. For additional information and resources, Marihelen suggests the web site Caregiver.com. If you have questions about the group you can contact Marihelen at 541-251-0498 or email her marihelenpc@gmail.com. You can also call the Chetco Activity Center at 541-469-6822. In this episode of Chetco Activity Center, Senior Stories, host Scott Clapson sits down with Ray Kornell, the Piano Man, to talk with his life experiences and his volunteer piano playing at the Chetco Activity Center. Ray shares with Scott about how he learned to play the piano and his years of traveling and volunteering to play at senior centers around Southern Oregon and Northern California. Ray has recorded sixty CDs that he gives out to people in the community and visitors to the Chetco Activity Center. Ray loves to encourage people with his piano playing and can be heard playing Mondays, Wednesdays, and Fridays at the Chetco Activity Center during the lunch in the dining room. 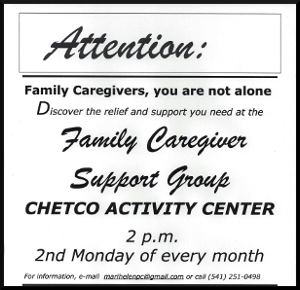 You can find out more about the Chetco Activity Center by calling 541-469-6822. In this episode of Chetco Activity Center, Your Gathering Place, host Scott Clapson meets with local Tai Chi instructor Tom Argyle to talk about the Chetco Activity Center, his love of Tai Chi, and the positive impacts both have had on his life. Tom began his journey with Tai Chi by taking classes at the Chetco Activity Center, and now regularly leads the classes along with three other instructors. Tom came from a background in martial arts and uses Tai Chi to improve mobility and maintain his joint health. Tai Chi provides a low-impact, strengthening workout, which can improve the balance and posture, and is open to people of all ages and ranges of mobility. Tom and Scott also spend time discussing the many options the Chetco Activity Center gives members to have fun and keep active, including pickle ball and a new yoga class. 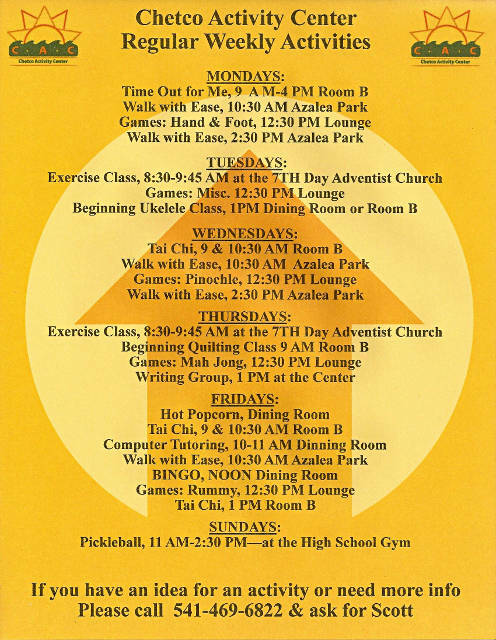 These classes are free to all Activity Center members! The information provided here is not intended to substitute for professional medical advice. Always seek the advice of your personal physician or other qualified health care professional before changing your healthcare treatment, diet, or lifestyle. Host Scott Clapson is back with the first episode of Senior Stories, a new series from the Chetco Activity Center. In this segment, Scott meets with long-time community member Jim Barrett, an active man who can often be found playing cards at the Activity Center or walking around town. Jim has led an exciting and serendipitous life. He spent his early years playing junior league baseball before settling in Brookings, where he spent twenty-five years as a sports announcer for KURY Radio and sixteen years as a playground aid for Kalmiopsis Elementary School. Join us as Jim talks about pinochle, the perils of the DMV, and his philosophy that “everybody is good at something” and that life is just as much about luck as it is about having fun. 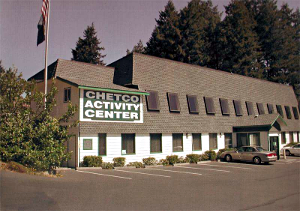 The Chetco Activity Center is located at 550 Chetco Lane (behind Subway) in Brookings. For more information or a schedule of weekly and upcoming events, call 541-469-6822 or visit their web site at ChectoAC.org. In this episode of the Chetco Activity Center, Your Gathering Place, Donna Rodoni shares with Scott Clapson about the Tai Chi class she volunteers to lead at the Chetco Activity Center. Donna talks with Scott about how she discovered Tai Chi and her own practice of 18 years. Donna and Scott discuss the connections that are made in the Tai Chi class with other people and how Tai Chi can make you a nicer, happier person. Volunteering at the Chetco Activity Center has helped Donna connect with the Brookings Harbor Community. Donna’s Tai Chi class meets Wednesdays and Fridays 10:30 AM at the Chetco Activity Center. 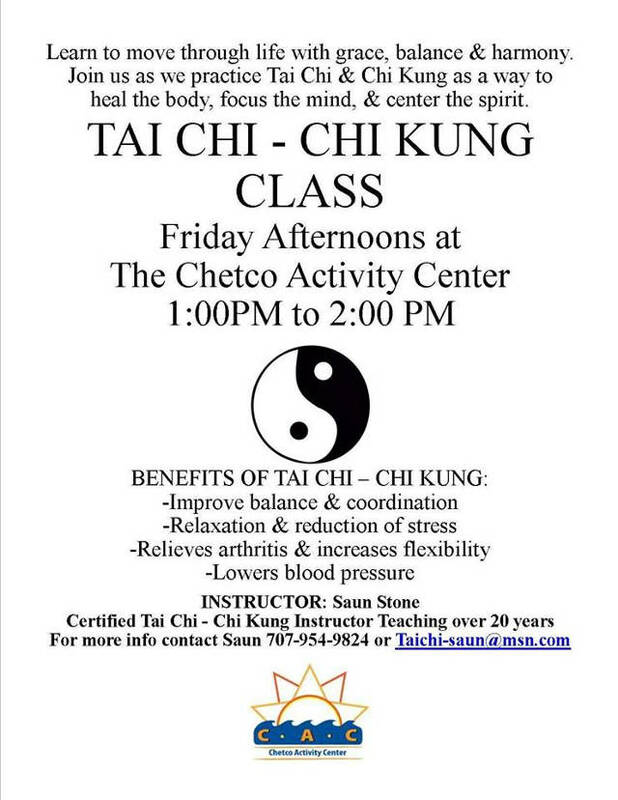 There are two other Tai Chi classes offered at the Chetco Activity Center: Wednesdays and Fridays at 9:00 AM; and an new class, added since this program was recorded, on Friday afternoons at 1:00 PM. 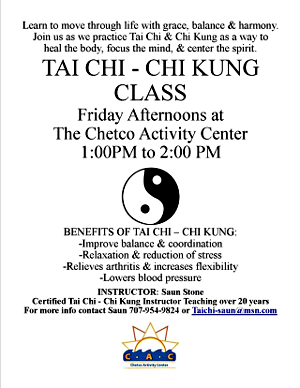 In this episode of the Chetco Activity Center, Your Gathering Place, host Scott Clapson talks with Saun Stone, the Center’s newest Tai Chi-Chi Kung teacher, about her new class on Fridays at 1:00 PM. They discuss the health benefits of practicing Tai Chi-Chi Kung, the difference it has made in their lives, and the impact of having three Tai Chi classes at the Chetco Activity Center. Saun and Scott are both very passionate about Tai Chi-Chi Kung and invite the community to a special celebration of World Tai Chi Day on April 30 at 9:30 AM at the Chetco Activity Center, 550 Chetco Lane in Brookings. There will be a potluck lunch and music following the Tai Chi practice that day. Beginners are welcome to attend. 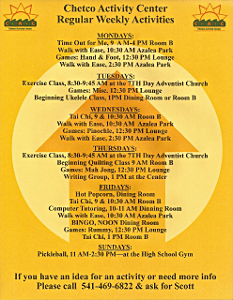 The Chetco Activity Center offers Tai Chi classes on Wednesdays and Fridays at 9:00 AM and 10:30 AM, and on Fridays at 1:00 PM. For more information call the Chetco Activity Center at 541-469-6822 and ask for Scott. In this episode of the Chetco Activity Center, Your Gathering Place, we talk about the Walk with Ease program. Glenda Groff (walking group co-leader), Mary Ann Reeder, Roger Mitchell, and Jenny Mitchell talk with Scott Clapson about the benefits they have gained from walking together. From relaxation and weight loss to both mental and physical health, Walk with Ease teaches us to build up slowly in our exercise program. This group has improved our health and relationships, and given us all motivation to walk. The Chetco Activity Center is grateful to Oregon State University Extension Area Institute on Aging and the Arthritis Foundation for helping us launch this wonderful program almost a year and a half ago. Get a free book to guide you on your way to walking with ease. 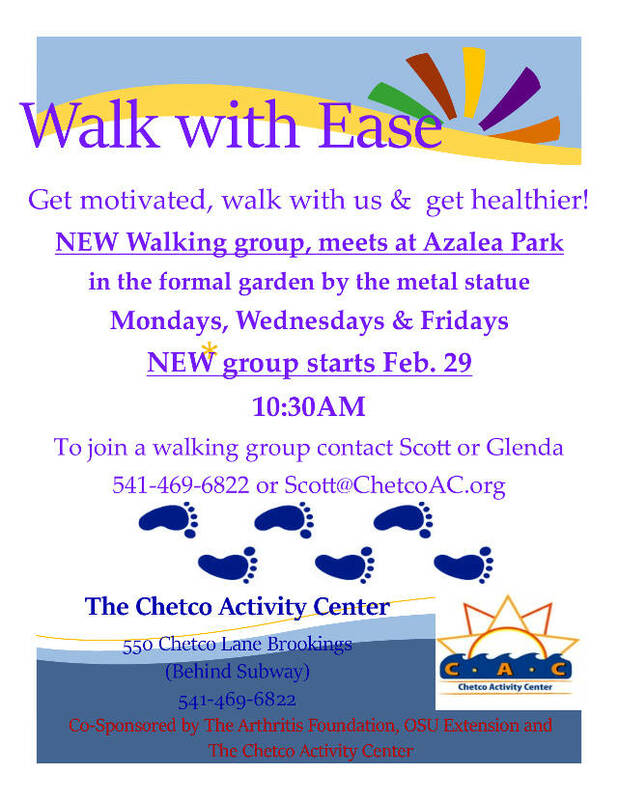 Come walk with us on Monday, Wednesday, and Friday at 10:30 AM in Azalea Park. Meet in the formal garden around the metal statue. In this episode of the Chetco Activity Center – Your Gathering Place, Eleanor Cook, Carol Owens, and Jean Westfall sit down with Scott Clapson to talk about the Meals on Wheels program at the Chetco Activity Center. Meals on Wheels serves low income house bound seniors who need nutritional support for a variety of different reasons. They prepare and deliver 50 hot meals five days a week with an extra two frozen meals on Friday for the weekend. This program operates mostly with volunteers in our community who help package the meals and deliver them to the recipients. You can help a senior in need get nutritious healthy warm food five days a week and two frozen meals for the weekend for only $35 a week or $150 a month. Please call the Center Activity Center to find out more at 541-469-6822. Thanks to all the wonderful staff and volunteers who make this important program happen.